Asparagus is one of my favorite crops because it comes in spring, and it comes unbidden. You don’t have to plant it every year to enjoy it every year, though if you take good care of it every year it will treat you even better than if you just let it grow. While you can start asparagus from seed, it makes more sense to plant established crowns bought from a reputable nursery. The seed is very slow to germinate, and must be nursed along in a holding bed through the whole season before it produces a usable crown for the following spring. But professionally grown crowns, of the latest and best varieties, can be ordered by mail, saving a lot of time and trouble for not much money. Either way, the crowns are planted as early in spring as the ground can be prepared. Dig a six- to eight-inch-deep trench about a foot wide, and place a shovelful of compost every fifteen to eighteen inches; set the crowns on these compost mounds with the roots fully spread out (not doubled over) in a sundial fashion. The side of the crown with the buds (the small lumps from which the spears will grow) should be pointing up and four to six inches below the eventual surface of the bed. Cover the crowns with a few inches of soil and compost mix, and leave the remainder of the soil from the trench heaped between the rows. Rows should be eighteen inches apart in beds, or four to six feet apart if you want a path between them. The plants can also be set equidistant in beds fifteen inches apart for intensive gardening, but make sure the bed is in topnotch condition in terms of soil preparation and fertility. In humid areas wider spacings will help avoid disease problems. As the first season progresses and the ferns grow, gradually fill in the trenches until the soil surface is level again. Avoid covering the foliage at any point, as this will slow fern growth and thus lower future yields. 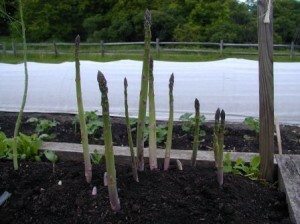 New asparagus beds should be watered regularly, at least weekly, unless there is regular, ample rainfall. In following years they can go without if necessary. The most significant disease problems in asparagus are fusarium rot and asparagus rust. Most new varieties of asparagus are resistant or at least tolerant to both. The major pest of asparagus is the asparagus beetle, a 1/4-inch-long black-and-orange beetle with a cross right on the middle of its back. They lay dark, shiny eggs no bigger than a speck on the emerging spears each spring. The larval form is 1/3-inch long, olive green to dark gray with a black head and legs, and wrinkled like a mummy. Both the adult and the larval forms eat the foliage of the plants and will disfigure the spears. Since they hibernate in garden trash, the best control is to cut back the ferns after the first hard fall frosts, clear the bed, and remulch with new material. To keep beetles from returning, cover the beds with a floating row cover until harvest. There is also a spotted asparagus beetle, slightly larger, which is reddish brown with six black spots on each wing. These and the occasional cucumber beetle that finds its way to the asparagus bed can be controlled the same way. Serious infestations can be dusted with rotenone powder, but this is not a long-term solution. Keep the bed weed-free, either by hand-weeding or mulching. Cultivation is not a good idea, as it harms the shallow crowns and lowers yields. Mulching can also be used to extend the harvest season. Simply pull back the mulch from part of the bed early in spring. That section will warm up sooner and bear sooner, too. On the still-mulched part, let the first few spears grow tall enough to begin unfolding their ferns before you cut them; that will slow down that section of the bed and stretch the season on the tail end without lowering overall yields. Harvest before the tips of the spears begin to open, either by cutting the spears on an angle, at or just below soil level, or by grasping them at soil level and snapping them off with your hand. If you’d like to try the European trick of blanching asparagus to produce tender white spears, heap more soil up over the plants—or better, apply an eight-inch ridge of fully matured compost over the row—and harvest just as the spears break through. One season extension trick you can use for asparagus is to treat your asparagus bed in thirds. On one third of the asparagus bed, erect a low tunnel with a row cover about a month before the normal harvest date. That will raise the temperature in that part of the asparagus bed and cause the spears to emerge a few days earlier than normal. In the second section of the asparagus bed, do nothing; that section will emerge shortly after the first. In the third part of the asparagus bed, heap hay or straw a month before the ground begins to thaw. That will slow the process of spring temperature rise in the soil, and delay the emergence of asparagus spears in that part of the bed. These three treatments can a week or two to the all-too short spring season for asparagus. Asparagus should be eaten or frozen as soon as possible after harvest, though it can be stored, standing upright, in a shallow container of water for a few days. After harvest, allow the ferns to grow throughout the summer until hard frost kills them, then cut them back to the ground and burn or compost them. The standard varieties for home gardens over the past forty to fifty years have been the Washington strains. Asparagus is a dioecious plant (which means there are separate male and female plants), and the females normally waste a fair amount of energy producing mixed-up, cross-pollinated seed, and littering the bed with it each fall. Unless the resultant seedlings are weeded out in spring, they will eventually compete with the mother plants, though it is unlikely they will ever bear as well, because of their random genetic background. A thirty-five-year breeding program at Rutgers University in New Jersey has now resulted in all-male hybrid strains of asparagus that yield three to four times as much as the Washington types. The first releases included Jersey Giant, adapted for heavy soils and generally considered the best all-around home garden variety; Jersey General adapted particularly well for the mid-Atlantic region; and Jersey King, best for the Southeast and desert regions. Jersey Jewel, because of a “persistent green” gene, was the best selection for edible landscaping, as the plants stay green and bushy longer than the other cultivars. One of the more interesting varieties now on the market is Purple Passion, which produces purple spears.